Six Star Pro Nutrition Creatine X3 Review – Should you use it? Muscletech has a thing for taking things to the next level, like in Six Star Pro Nutrition Creatine X3’s formula. For those who are not aware, Six Star Pro Nutrition is an offshoot manufacturing company of MuscleTech. Obviously, MuscleTech kept the good stuff within the brand, and cheaper alternatives are offered under their Six Star Pro Nutrition brand. We’ve reviewed a bunch of other MuscleTech products on our website, and we’re particularly keen on measuring the ingredients to see if they match up against the best in the business. Much to our amazement, the ingredients found in Six Star Pro Nutrition Creatine X3 is actually tons better than the Creactor formula and BCAA sold by Muscletech. In fact, serving per serving of both products suggest that Six Star Pro Nutrition Creatine X3 edges its mother brand by having more creatine and BCAA per serving at half the price of both supplements combined. Six Star Pro Nutrition Creatine X3 contains both creatine and BCAA, nutrients that are essential for muscle recovery. BCAAs are important to prevent muscle catabolism, while Creatine is essential for refueling your muscles. Six Star Pro Nutrition Creatine X3 also contains fast-absorbing carbohydrates which are quickly converted to glycogen to help replenish lost glycogen stores after an intense workout. Who uses Six Star Pro Nutrition Creatine X3? Six Star Pro Nutrition Creatine X3 is a value-for-money supplement, which means that it’s a supplement that individuals use when looking for a bargain supplement that can provide them with most of the nutrients they need. Due to its affordable pricing and loaded ingredients, it’s no surprise that many users are taking Six Star Pro Nutrition Creatine X3 to replace their current BCAA and Creatine products. We’ve reviewed a bunch of BCAA and Creatine products on our website, and we’ll measure the effectiveness of Six Star Pro Nutrition Creatine X3 based on products that we have found to be effective. First off, what strikes us the most about Six Star Pro Nutrition Creatine X3 is its loaded creatine content. At 8 grams per serving, Six Star Pro Nutrition Creatine X3 contains one of the highest creatine content on the market per serving. This is a great advantage especially for individuals who are buying creatine products separately to supplement their creatine needs. Another striking comparison to other products is the 2.5 gram BCAA content, which is within the range of acceptable BCAA dosage per serving. It’s just too bad that they did not publish the exact BCAA ratio to help their potential customers understand what to expect from the product. 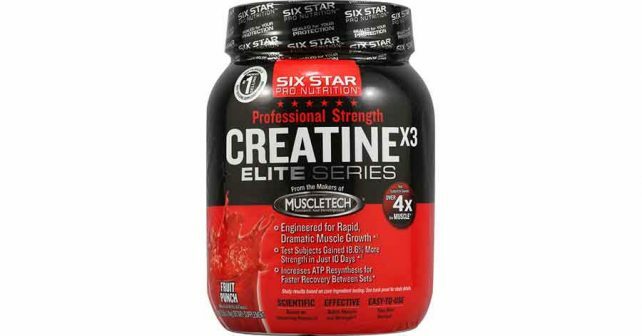 Six Star Pro Nutrition Creatine X3 is a great value for money supplement. If you’re using a creatine and BCAA supplement, you better check out Six Star Pro Nutrition Creatine X3 to see if it fits your supplement regimen. However, creatine and BCAAs are not enough to get the job done. You would still need the best supplements for muscle gain to help build muscles effectively. Combine Six Star Pro Nutrition Creatine X3 with NitroGenix 365 for best results.